We’ve been a little surprised at the infrequency of egg laying by our chickens. However, my mother-in-law Debbie discovered that Layla has been using a spot behind the grill for her own nesting box. 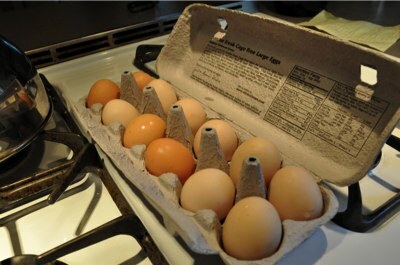 In fact, Layla had laid 8 eggs in the same place away from the coop. The sudden supply of eggs means we’ve now had over 20 eggs laid, bringing the average to closer 1 a day. I was so pleased I dropped them all in to our surrogate egg crate. ..and I turned 30. We share a birthday out of convenience. Michelle threw a surprise party for me over the weekend and I was honestly shocked. It was my first surprise party and I hadn’t an inkling that anything was going on. In fact, when people said “surprise,” I looked behind me to figure out who all these people I knew were saying it to. At the same time, my brain was trying to reconcile why friends from different towns and eras were all in the same place. Michelle totally got me, then forbade me from doing it to her. I can’t really say much about 30 because it doesn’t really seem any different. I suppose weight is easier to gain than lose, and I spend more time talking about health care benefits with friends, but I’m living largely the same life as I was at 28. I take solace in knowing that I’m not as old as Barley though. He’s aging fairly well considering the shape of his hips, and he’s become a good friend and protector for Ella. However, he’s going to be passing from Barley Roostopher to Elder Statesmen RooBar here in the next few months. Posted on September 22, 2008 Categories blahblah3 Comments on Barley turns 49 (7)..
One of the problems with Elections is that their news coverage completely obscures all the other stuff happening in the world. Take for example our active military campaign in Pakistan. Yes, Pakistan – the country who just elected a new president and whose government seems to have tenuous support. We’re currently bombing suspected Taleban and terrorist targets in the sovereign nation. Pakistan, our partner in the war on terror. Well, these cavalier attacks are ruining our image in Pakistan and can only help to destabilize the troubled government. heh.. while I was writing this I found news that Zardari is handing off presidential power. Two of the three hens have been laying, but it appears that Bitchzilla, despite her early lead in size and attitude, is now the most timid, and most immature. Well, she may be on the verge of maturity now as we’ve found an egg that looks like a first try. At first we thought it was broken because of the odd pitch it was at and the weird shape. When I picked it up to remove it from the coop, I realized that it was still fully intact, but the shell was only slightly more solid than a balloon. Instead of a full egg, it was a thick membrane around a yolk. When hens start laying, you should expect a few eggs that aren’t quite done. Some will just bee the inner goo (white & yolk), and some with have various stages of calcification as the shell machine comes online. Looks like we’re about to the point of having a working egg production line. Now, if only we could get them to lay in the nesting box instead of all over the run. It would be nice to have some eggs that weren’t covered in droppings and feathers. I think that’s one of the sub-rules under the major rule “Don’t let an idiot cook a $200 egg.” The major rule includes such wisdom because you can’t see if the butter has browned, or burnt. It also recommends against giving your toddler an easy to open bottle of bubbles, and something about having a diaper on. Needless to say, it was didn’t taste quite like the $200 I expected, but it’s unclear if that is because of my distracted, clumsy cooking, or because I adulterated the mixture with 2 other free eggs. Don’t get me wrong, they were still good, though ended up as scrambled instead of fried and on a sandwich with fresh lettuce, tomato and cheese. But it was still quite good. Even Ella ate all of hers. Michelle made breakfast with the third free egg (or $50 egg if we decide to reduce the loss on the first 3) and it looked much better than mine, but I trust the difference was all in lighting. And maybe years of successful egg work. Someone finally laid an egg. We don’t know who, but Clem noticed it in the dirt below the arborvitae. We’re going to call this the $200 egg so all the next to come are free eggs. Last night I finally clipped Layla and Boots’s wings. Clipping their wings actually means you trim the ends of the primary flight feathers, the long ones at the end. You only clip on one sides so they don’t have adequate balance to fly. I’ve been putting it off for some time, simply because I didn’t want to clip until it was necessary. I’ve read about it several times, even watched some YouTube videos. Well, it took less than a minute for each chicken. Most of the time was spent just picking them up and getting them comfortable. The clipping took only a few seconds, then they were off to eat some scratch. Hopefully that’ll help keep poop off of everything. And flies. My 3.3 year old mac is at the apple store getting its logic board replaced. FireWire and Ethernet have been flakey for several months, but when bluetooth fully died, then kernel panics and finally a crash from which there was no reboot, it was time to realize that something was wrong. As much as I’d like to pick up an intel mac, I’m not ready to drop the coinage. Luckily, I’m told they’ve fixed the problem and I can have it back tomorrow. Great service, Apple.